Soak rajma overnight. Cook in pressure cooker for 3-4 whistles. Remove water and keep it aside. Heat oil in pan. Add cumin seeds, mustard seed, asafoetida, after mustard seeds pops out, add 1 cup of water. Then add red chili powder and turmeric powder. Let it boil for 4-5 mins. 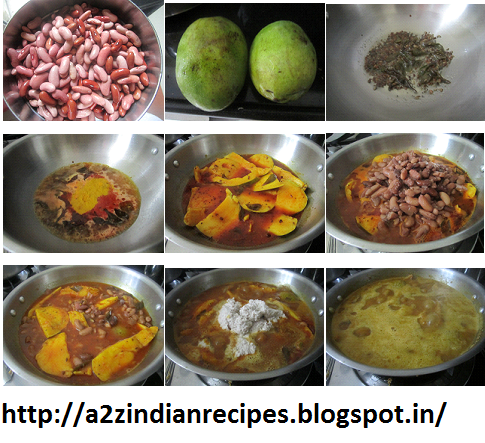 Then add chopped mango with seeds, Saute for few minutes. Then, add jaggery, salt, coconut paste and stir well. Then add cooked rajma and 2 cup of water. Stir well. Cook for 7-8 min. Serve hot with rice/chapati.